Situated high in the Andes, 3,400m above sea level, Cusco was once the capital of the Inca Empire. This spectacular city is a history lover’s dream. 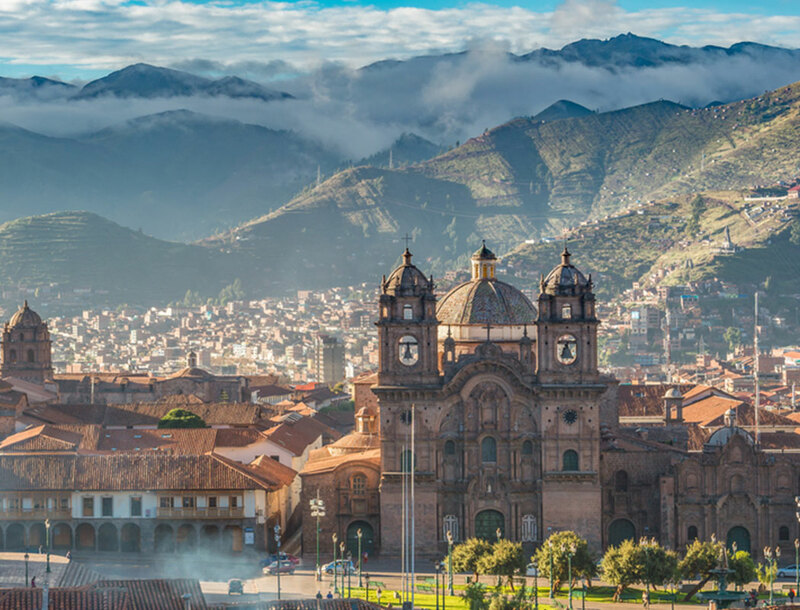 Dotted with World Heritage sites and gorgeous cloud forests, Cusco is a city with so much to offer the wandering traveller. Cusco’s Plaza de Armas is the hub of the city. The Plaza de Armas is the perfect place for kicking back in its many bars, cafés and restaurants as you acclimatise to the high altitude. The centre of the square features a beautifully kept garden with an intricate statue of Incan ruler, Pachacuti. The square itself stands on the area that was once the Haukaypata – Great Inca Square. Today, what you see most is the Spanish colonialism. However, traces of the Inca Empire can be seen in the intricately carved foundation walls of these buildings. Just under a 10-minute walk from the Plaza de Armas, you’ll find the colourful San Pedro Market. Filled with rows and rows of fresh fruits and vegetables creating a spectacle of colour. The excitement is just beginning, because there’s also dozens of juice stands; offering juices made with exotic Peruvian fruits, as well as heaps of food vendors offering just about any Peruvian speciality you can think of; from empanadas and salchipapas (fried sausage and potatoes) to the more acquired antichucos (beef heart). The market offers more than just food, with a wide selection of high quality alpaca and llama wool jumpers, scarfs, beanies and more. In addition, you can also find little souvenirs and trinkets to remember your time in Peru. There is so much to see, you could easily spend a whole day there. It’s best to go in the morning especially if you want to buy some of the fresh foods. Built during the Inca period, Sacsayhuaman or “House of the Sun” is a wonderful combination of fortresses and temples. Situated at an altitude of 12,140 feet above sea level, Sacsayhuaman covers an area of roughly . This ceremonial Inca fortress was built by approximately 20,000 men. It is believed they cut and transported gigantic stones from Huaqoto and Rumiqolqa for the build. One of the many reasons this fortress is such a marvel, is the extraordinary size and construction of the stones, weighing up to 138 tons. The different sized stones are fitted and joined without any kind of mortar! Cusco Planetarium is one of the world’s most unique planetariums offering an informative and entertaining tour. The tour starts with shared stories that help us understand why Peruvian ancestors observed the stars to better understand the world. You can visit the dome where you can enjoy a stunning projection of the sky. Observe official constellations, as well as Inca constellations learning the stories behind them. Weather permitting, to conclude you will be able to observe numerous stars, nebulas, planets and constellations of the skies of the Southern Hemisphere, with the planetarium’s high tech telescopes. A combination of astronomy and history, the experience at the planetarium is truly like no other. Qorikancha (also known as the Golden Enclosure) was dedicated to the highest gods in the Inca pantheon. It was also the Inca capital of Cusco. These gods included Viracocha, the god of creation, Quilla the moon goddess and especially Inti, the god of the sun. The name translation is, “Qori” meaning gold and “Kancha” meaning an enclosed space, bounded by walls. The approximate translation is “place that has gold”. There are temples for each god. The most significant is the Temple of the Sun. This Temple was the very centre of the Inca world and the most sacred site of all. From above you can see that the layout of the site actually resembles a sun with rays shining out in all directions. These were the sacred ceque (zeq’e) lines – physical and cosmic roads – 41 of which led to 328 sacred sites. Cusco was laid out to represent a jaguar. The Jaguar tail, home to Qorikancha. Complying with Inca symmetry, the second most important sacred site in the city, Sacsayhuaman – located at the head. Qorikancha was built where the city’s two rivers (Huantanay and Tullamayo) meet. Cusco offers an abundance of sights and sounds. Be sure to stay for more than stop over enroute to Machu Picchu because this ancient city has a lot to offer.